From the very beginning, we have been a collective of individuals. Different kinds of people from different kinds of places. An intersection of technology and the liberal arts. Diverse backgrounds, all working together. One powerful thing we share is the belief that we can make a difference in this world. Through our products. And through our values. Through who we are. For this reason, we put inclusion and diversity at our very center. We honor individuality, human dignity, and equality. We want people to be themselves. And contribute through their own, individual experiences. Because this environment inspires creativity and innovation. And empowers us all to do the best work of our lives. Together. 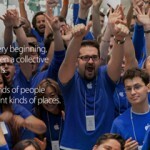 The video ends and the webpage begins with the motto, "Inclusion inspires innovation," which was first stated by Apple CEO Tim Cook in congratulating the Apple employees and their families who joined "Apple Pride" in support of LGBT rights late last June. 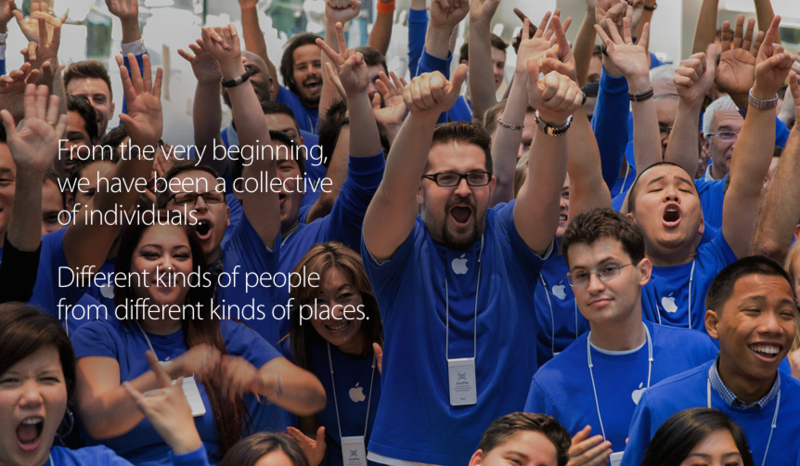 According to Apple's diversity report, Apple's worldwide workforce is 70 percent male and 30 percent female. In the U.S., 55 percent of Apple's workforce is white, 15 percent Asian, 11 percent Hispanic, and 7 percent black.